Apple’s iOS Mail has a universal inbox on iOS 4. 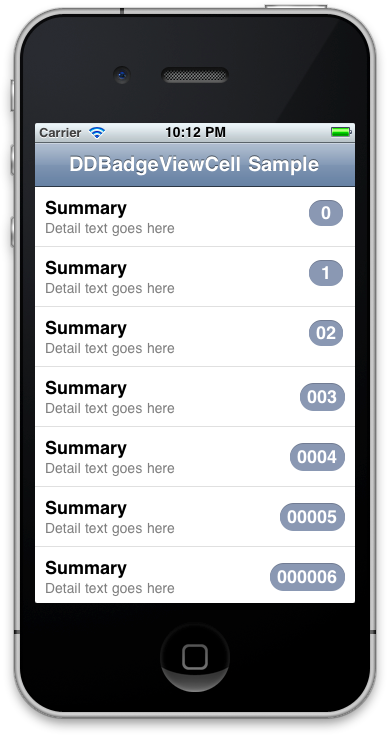 Very handy in general, but its unread badges complete the feature. I frequently glance down the list of email addresses I have and know exactly what the state of my inboxes are. I never have to wonder how many new emails I have. I just check the numbers. 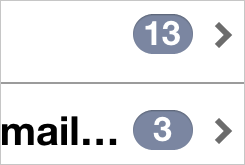 I wanted to duplicate Mail’s look and feel, so I needed the exact colors that Mail uses for its badges. xScope made it easy. If you look closely at Mail’s badges, you’ll notice the top part of the arc looks indented. The shadow gives the label a feeling of depth; the badge looks almost letter-pressed. To duplicate that look, I simply drew a darker oval one pixel higher than the original before drawing the real one. // Draw the badge shadow. DDBadgeViewCell does an excellent job when there are three or more characters in the string. But as I wanted to display numbers, I needed to special-case the code a bit to get the pixels correctly aligned. // Set up the badge's frame. // Fix the width for 1-2 characters. // Draw the number on the badge. // CGRectInset cuts off the label by a couple pixels, so need a bit more tweaking.